A network printer provides convenience to different workgroups and Sharp Workgroup Printers, Frontier Series offer innovative solutions that increase efficiency and deliver exceptional results. Sharp’s OSA technology simplifies document work flow. These printing devices allow users to work with network applications, directly, from the LCD panel. Sharp Workgroup Printers, Frontier Series provide high speed printing with high quality output. They include several advanced features like document security, direct printing, web-based device management, user friendly document filing system, among others. Sharp MX-B400P is an efficient laser printer that helps boost productivity in a workplace. It delivers high performance with its powerful 800 MHz processor. It produces exceptional prints with its high resolution of 1200 x 600 dpi. High quality images are created with its Advanced Image Stabilization. It offers cost efficiency, having a low cost per print and total cost of ownership. It prints fast with a speed of 40 pages per minute. This printer includes a color LCD screen panel that simplifies operation with its graphical user interface. You can, easily, navigate through the different functions. It is; likewise, trouble-free to integrate with network software applications with the help of Sharp’s OSA® development platform. Sharp MX-B400P comes with the printer’s Document Filing System that is easy to use. Its 80 GB memory allows speedy document storage and retrieval. It provides convenience with its direct printing function, enabling you to print straight from a USB, FTP server and embedded webpage, among others. Without the use of a printer driver, you can print the following types of files: PDF, JPEG, TIFF, XPS, PRN, TXT, PCL, and PostScript®. This printer is environment-friendly with its low power consumption. It makes use of Sharp’s toner recycling program which supports an easy-to-replace and long life tri-component supply system. It comes with an advanced network and document security which is a trademark of Sharp. The company has won awards for this. Sharp MX-C400P is a workgroup laser printer that helps increase productivity and efficiency of an organization or business with its fast speed and high quality of printouts. It has a 40 page per minute print speed and a print resolution of 1200 x 600 dpi. With these features, it is able to produce rich and vibrant prints. It has a high resolution color LCD screen panel that includes a graphical user interface which allows ease of operation. For better performance, the printer comes with a powerful 1 GHz controller. It is capable of multiple printing, directly from sources such as a USB, FTP, embedded web page and others. It provides network and document security that protects the confidentiality of your intellectual property. Sharp MX-C400P is economical, having a low cost per page and total cost of ownership. It, also, offers low power consumption, making it energy efficient. Its Optional Inner Finisher takes care of time consuming tasks like sorting, offset stacking and stapling. This, in turn, leads to increased productivity. Sharp MX-C311 is a multifunctional printer that has a small footprint to fit into any workplace, yet, it boasts of several essential features and functions. It comes with an 8.5” touch screen panel that has an intuitive user interface to make it simple to operate. It gives crisp, color prints and copies at a print speed of 31 pages per minute. It comes with an 800 MHz controller for multi-tasking. This printer comes with a document filing system that is easy to use. It makes use of ImageSEND™ technology that lets you scan documents to a network folder, email and USB memory devices in different formats such as PDF, Encrypted PDF, JPEG, TIFF, network folder and email, to name a few. Sharp MX-C311 gives high quality network printing with its resolution of 1200 x 600 dpi for both mono and color. High quality images are printed from beginning to end with its Advanced Image Stabilization. It, likewise, functions as an integrated monochrome and internet fax machine. 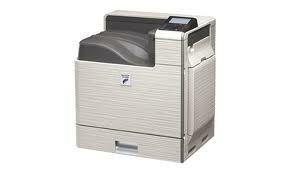 Its optional super G3 Fax module presents an advanced feature of automatic staple received faxes. Fax messages are converted to email by Inbound Fax Routing. This printer, also, includes the Sharp OSA® platform that helps simplify work flow and the Sharp security suite that safeguards confidential documents. Sharp Workgroup Printers, Frontier Series feature Sharp MX-B400P, Sharp MX-C400P and Sharp MX-C311. They boast of high speed and high quality output. In addition to these, they make use of exclusive innovative technologies that further enhance productivity and efficiency in a workplace.